This classic veal Parmesan recipe is one of my favorite easy recipes. The cutlets are breaded, fried, and then baked to perfection with tomato sauce and cheese. Sauté some mushrooms and peppers or onions and place them over the cutlets before you add the tomato sauce. The recipe can also be made with turkey cutlets or chicken breast cutlets. Alternatively, make it a vegetarian dish with sliced eggplant. Take a look at the tips and variations for more ideas. This makes a delicious meal with angel hair pasta, spaghetti, or linguine. Add a salad and garlic bread for a fabulous family meal. Heat the oven to 350 F (180 C/Gas 4). Lightly grease a shallow 13-by-9-by-2-inch baking pan. Dip cutlets in beaten egg. Then, dip them into the seasoned breadcrumbs. Heat the oil in a large skillet over medium heat. Place breaded cutlets in the hot pan and fry them for about 3 to 4 minutes on each side, or until browned. Place the browned cutlets in the baking pan and sprinkle with a few tablespoons of Parmesan cheese. Spoon the tomato sauce over them and then sprinkle with the dried basil. Arrange the mozzarella cheese slices over the cutlets. 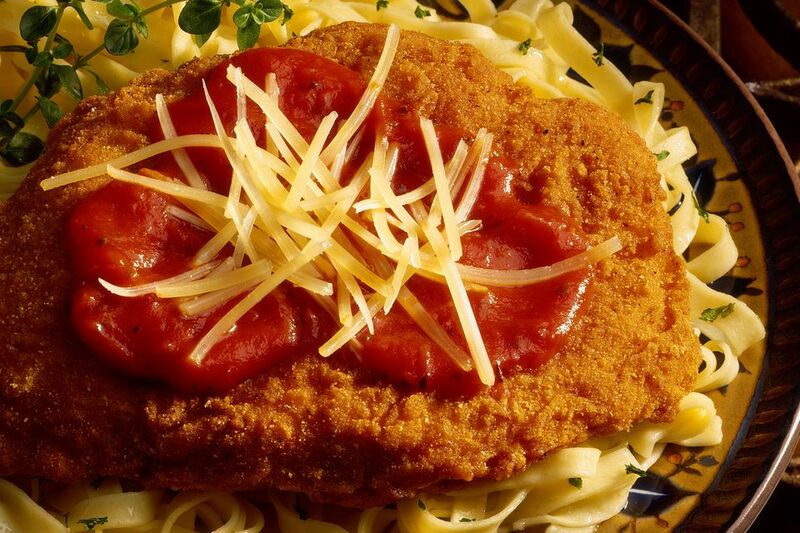 Serve the cutlets and sauce with spaghetti, linguine, or angel hair pasta, along with garlic bread and a tossed salad. Be sure to offer more Parmesan cheese at the table. Replace the veal cutlets with thin turkey cutlets (scallopini). Replace the veal cutlets with thinned chicken breast cutlets. Replace the veal cutlets with thin pork cutlets or flattened pork tenderloin medallions. With Mushrooms: Sauté about 4 to 6 ounces of sliced mushrooms in butter or olive oil until tender and browned. Spoon them over the veal cutlets in the baking dish. Cover with the Parmesan, tomato sauce, basil, and mozzarella cheese and bake as directed. With Peppers and Onions: Sauté about 1 cup of red and green bell pepper strips and 1 sliced onion until the onion is translucent. Spoon the peppers and onions over the cutlets in the baking dish. Top with the Parmesan, tomato sauce, basil, and mozzarella cheese and bake as directed. Replace the tomato sauce and basil with 1 cup of your favorite commercial spaghetti sauce. Use a homemade marinara sauce instead of plain tomato sauce and basil.